Created in China (not Italy, as most people believe) noodles were an integral part of the Chinese diet. There are several kinds of noodles in Chinese cuisine, mien noodles (egg), rice noodles, wheat noodles and bean noodles. In northern China, wheat noodle are eaten more regularly than rice or rice noodles. Rice noodles are considered a southern Chinese staple. 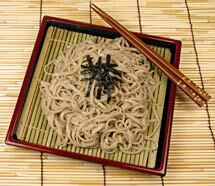 A Soba noodle is made with wheat flour and buckwheat. It’s high in fiber and has a nutty, full-bodied flavor. The higher the buckwheat content, the more expensive the noodle. Soba noodles are typically served in soups or with a plain with a dipping sauce. Less expensive alternative: whole wheat spaghetti or linguini. Ramen are thin and skinny curly dried egg noodles that are typically sold in an instant soup form. There is usually a packet of flavored instant soup powder in the package. There isn’t really a less expensive alternative as they are cheap, cheap, cheap but regular spaghetti noodles are pretty close. Rice noodles are round or flat, thin and slightly translucent white noodles made from rice flour and water. They kinda have zero flavor of their own (just a great squishy texture) and they pair with just about any strong meat or fish flavor. You can substitute vermicelli, linguine, or fettuccine but it’s not really a close match. For most, the tried and true method of cooking noodles is to boil them and then add them to the other ingredients, pour sauce over them or add ingredients to the pot they were cooked in. I really don’t have much to add to that for my column other than don’t over cook them and read the instructions on the package. Dried noodles can be kept until just about the next ice age in a cool, dry, dark place. One final “noodle note” – those ‘chow mein’ found in most Chinese restaurants are an American invention so if you’re looking for “authentic,” pass them up and get yourself the real stuff.